The MBS gateways are based on the same product platform and therefore offer an extraordinary degree of versatility and flexibility for adapting to changing requirements – an advantage that results in especially low total costs: new gateway purchases are rendered unnecessary because the devices’ adaptability means new functionalities can simply be activated. The MBS gateways offer a wide range of functionalities that help our customers reduce outage periods, shorten integration times and cut costs in the long term. 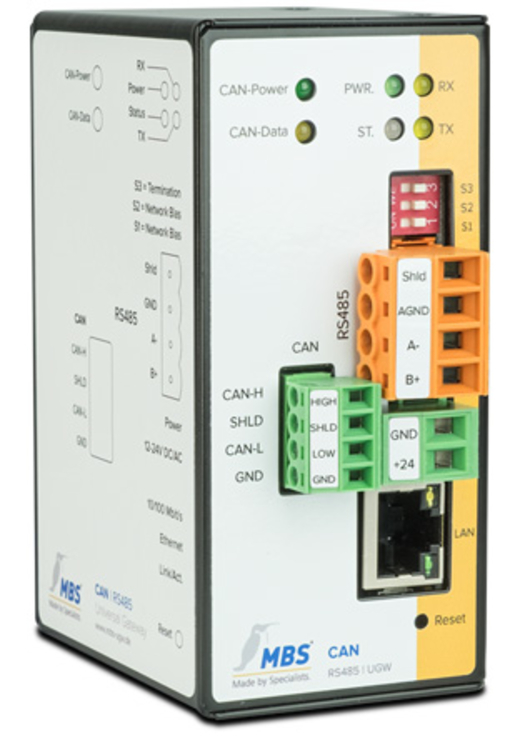 The integrated CAN-adapter make the usual external bus couplers unnecessary, reducing the amount of wiring required and enabling faster connection to serial or network-based communication protocols. With its numerous available communication protocols the CAN offers for nearly every requirement the right solution. On request, proprietary protocols can be implemented. The configuration of the CAN gateway will be done with text files, these are transferred on an integrated webserver via a browser on the gateway - the configuration is permanently saving on the gateway - optionally as backup in a Dropbox (requires Internet connection). The new multi gateways feature a new web interface for configuration and analysis that makes configuring the devices significantly easier, allowing them to be taken into operation more quickly. The web interface additionally provides access to the various upgrade options for the MBS gateways, for example activation of up to 2500 data points. The gateways are equipped with a real-time clock and optionally a storage card on which e.g. trend log data can be recorded. The devices are available with 25, 200, 500, 1000 and 2500 data points. The activation is done via the web interface. Activating the Dropbox option lets you record trend data and create intelligent backups of the gateway configuration. This option is also ideal as a basis for redundant systems. The ARM9 processor offers outstanding performance, enabling data processing for all major use cases.